As our tuk-tuk trundled down the pitch-black dirt road that led out of Harar, an ancient walled city in eastern Ethiopia, pairs of shining lights began to dot the sprawling dark scrub in the distance. What I had assumed were headlights of other tuk-tuks heading out into the night, were actually the reflective eyes of the animals we had come out here to see: Harar’s revered wild hyenas, who were waiting for their dinner. We had arrived in Harar the night before, and chosen to spend 2 of our 5 days in Ethiopia here because of the town’s unique culture. The UNESCO World Heritage-listed town is devoutly Muslim—82 mosques, some dating back to the 10th century, are hidden within the old town’s winding, cobble-stoned alleys, and the city is deemed the fourth holiest in Islam, known as Africa’s Mecca. 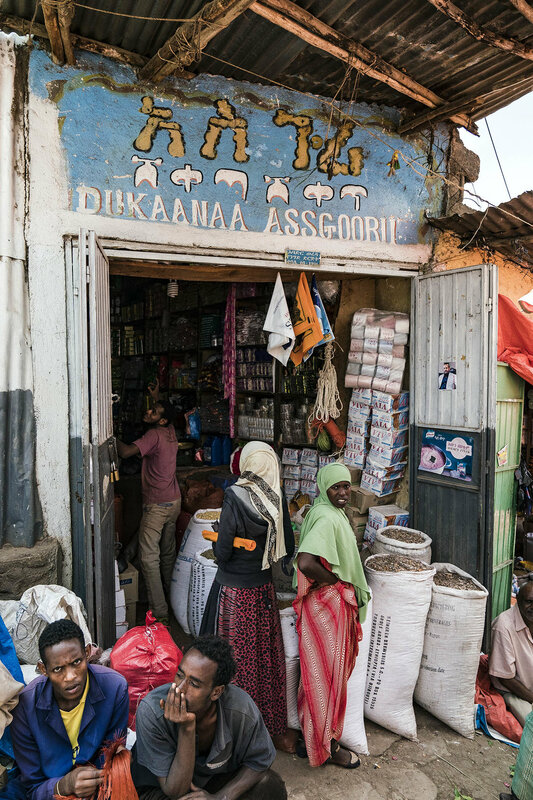 Ethiopia is one of the oldest Christian states, and despite the dominance of Orthodox Christianity among the general population, Harar is known as the “City of Peace” as Muslims and Christians have lived here in relative harmony for centuries. Flying in from Cape Town, we had culture shock. Flocks of stoic women robed in long, colourful flowing dresses sized us up as we searched for a place to eat; stone-faced men drinking coffee stared as we walked past; and little children chased after us yelling “faranji, faranji,” “foreigner, foreigner.” We had arrived knowing shamefully little about the town (and country) we had landed in, so when a twenty-something, dreadlocked local approached us and handed us his business card, asking if we needed a guide, we told him we’d meet him tomorrow. We wandered the narrow alleys in search for markets, historic homes and ancient mosques; he introduced us to vendors selling chats, the ubiquitous stimulant leaf locals chew all day, every day; he took us to the butchers’ square, where eagle-eyed kites perch on rooftops, waiting to dive for falling offcuts; we met up with one of his friends, who showed us a traditional coffee ceremony; and took a tuk-tuk to the verdant hills of Koremi, where excited Arggoba children brewed us cups of salted coffee tea (made with the shells of the coffee bean) and cooked us their country-style injera flatbread, made with burghul, not the usual Ethiopian teff grain. 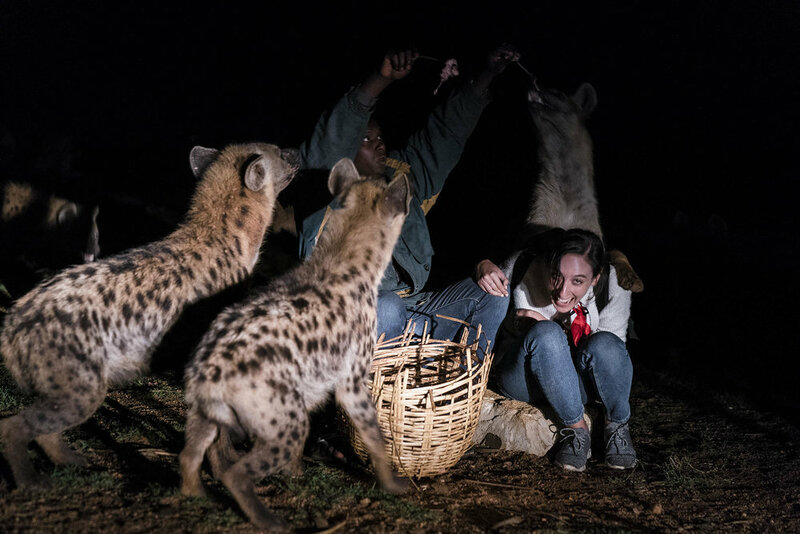 But the highlight of our tour happened after the sun went down, when the local hyenas begin to stir from their daytime slumber. In Harar, the hyenas are a respected animal, and man and beast have lived side by side for centuries. “It’s a legendary story,” explains Edom. After a famine, hyenas had begun attacking people in town. One of the kings met with the hyena pack leader and supposedly negotiated with him that there would be no more attacks if they were fed food in return. The community fed the hyenas, and a friendship began. “On the first day of the new year, the holy day known as Ashura, the hyenas are still fed rice porridge,” Edom says. Apparently if the porridge is left uneaten, the year is cursed with bad luck. But it’s not just the legend that wins the people’s respect. “Hyenas are scavengers, so they clean up the streets. Local’s believe hyenas are the only animal who can get rid of the bad spirits. That’s why they let the hyenas go to into the city.” The fortified town walls, built between the 13th and 16th centuries, have small hyena-sized wooden gates that are opened each night to let the prowling dogs enter the city and graze the gutters. As our tuk-tuk pulled up to a clearing in the bush, the headlights revealed a pack of twenty hyenas. Edom introduced us to Abbas, one of the dog’s loyal feeders. As we got out of the vehicle, a hyena rushed past me and I realized just how big these guys are: taller than any dog I’ve ever encountered, hyenas can grow six feet long and three feet tall, and weigh up to 86 kilograms. Abbas walked to the centre of the pack with a big basket full of camel meat, grabbed a stick, and began to feed the beasts. He communicated with the animals with a series of low- and high-pitched whistles. It was clear he was in control­ – not one tried to sneak a piece from his basket, instead waiting for their master to hand them their feed. Abbas motioned for me to come and join him, and as I sat down, he shoved a stick in my hand, a hunk of camel meat hanging off the end. An excited, cackling hyena approached and timidly chomped off the meat. From afar the hyenas had looked almost beautiful, their velvety spotted coats and small faces mimicking a cute, slightly-mangled leopard, but up close these beasts were terrifying. Their beady black eyes seem too small for their long, bear-like snouts and rounded ears. Their mouths, ragged with patches of fur and speckled with pink, warty lumps, were truly repulsive. Without warning, Abbas began dangling a hunk of meat above my head and a big, heavy hyena jumped on my back to reach his feed. As thoughts of death, rabies, a mauled face, and my travel insurance policy passed through my mind, I thought of how I had left my friends in South Africa, most of whom were on luxury safaris right now, watching elephants and giraffes run to a backdrop of sunset on the savannah, some with champagne in their hands. Once the meat had been devoured, Abbas threw a bunch of bones to the remainder of the pack, who gathered around crunching, cackling and slobbering. Surrounding us were the lights of more eyes watching us, and the distant sound of actual laughter, reminding me of the giddy, psychotic scenes from The Lion King. Abbas, who runs a shop in town during the day, has been doing this for the past 16 years. “I started when I was seven years old. I’ve never been bitten,” he tells us. His father, Yusuf, was the first “hyena man” in Harar – there is now a Christian one, too, who feeds them beef scraps ­– had taught him to feed the hyenas as a boy; he had loyally fed them for forty years before he stopped and Abbas took over. 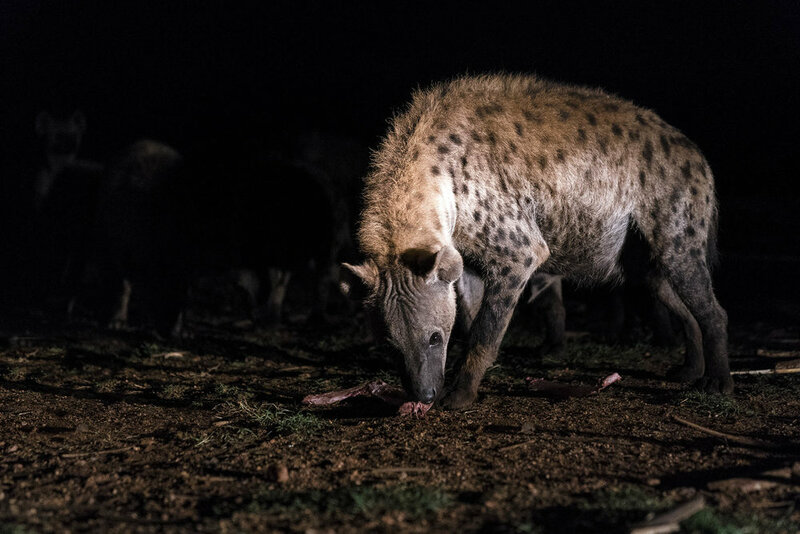 Most of the hyenas his father fed have since died, but Abbas points to a feisty one crunching a bone, “this one is my favourite, Willie, he’s about 12 years old.” Hyenas can live to about 30.